How many shares you buy is based on your money management plan and should depend on the amount of money you are willing to lose on a trade not on how much you want to make. Define your exit strategy before you place your trade not after when you have money on the line. Look at the two-year, weekly chart of Golden Star Resources (GSS) shown below. 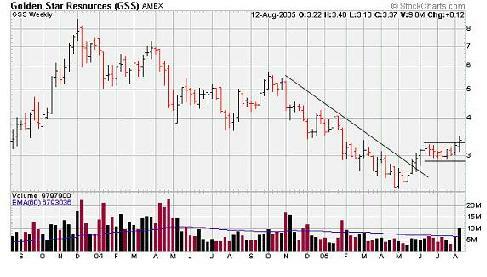 On Friday August 12, 2005 on above average volume, it appears that GSS may be making a breakout. The long-term trendline was broken around mid May. The stock seems to have stabilized and now appears to be ready to resume the up trend. 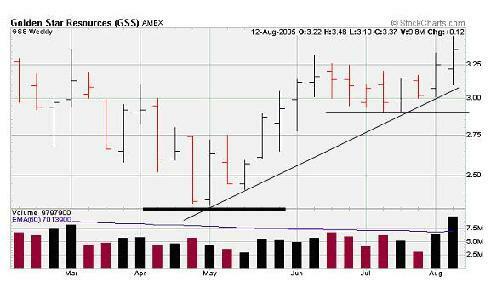 The chart below is a six-month, weekly chart. There are at least three sell points you may want to consider. One is below the 6-month low of $2.25, the next is just below the last low ($2.90) and the last one is below the trendline ($3.10). If you want to buy at Friday's closing price ($3.37) on Monday and have a $10,000 account, how many shares should you buy? Using basic risk management principles, if you risk 2% of your capital ($200) and the commission is $20 to buy and sell then you can only lose $180 on the trade. With a sell stop loss point just below 2.25, you will be the furthest from the market but only able to buy 180/(3.37 - 2.24) = 159 shares rounded down to 100 shares. Placing a sell stop at $2.89 you can buy 180/(3.37 – 2.89) = 375 shares or if you round down, 300 shares. However, placing your sell stop loss at $3.09 would mean you could buy 180/(3.37 – 3.09) = 642 shares or rounded down, 600 shares. In either case, the risk is essentially the same. You can see that once you have set your risk tolerance, it is your sell stop that determines the number of shares you can buy. To learn more about how many shares to buy you may want to read Alexander Elder's "Come Into My Trading Room".